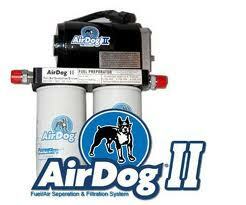 AirDog® II is designed to operate at flows and pressures beyond the maximum requirements of the engine. It receives fuel under vacuum from the fuel tank containing entrained air/vapor, particulate contaminates and unknown quantities of water. 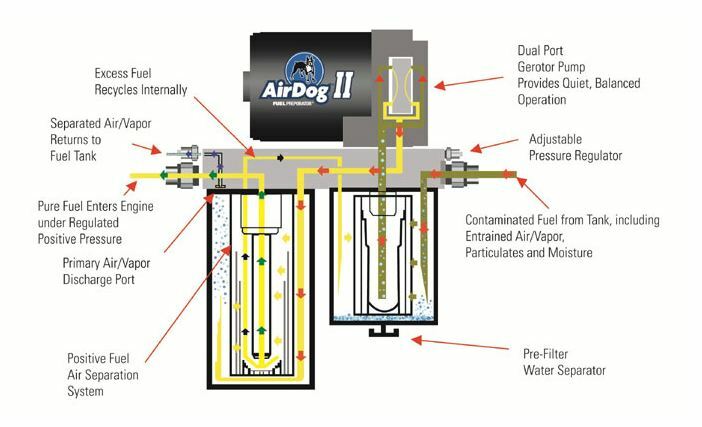 As it passes through the AirDog® II Unit it will separate the Air/Vapor from the fuel and Filter the Fuel to a 2 Micron Level before supplying your engine will clean, air free fuel. One of the Key Features that we at ECD like about this unit is the fact that it will circulate the unused fuel within the filter base versus returning the fuel back to the tank like the AirDog® Original and other competitors pumps. With this feature you are only filtering and separating the Air/Vapor off the fuel once, instead of returning the fuel back to the tank. 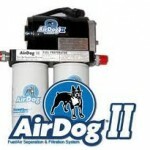 All AirDog units ship with Vehicle Specific Complete Install kit. With a starting Price of $670.00 We have found that the AirDog DF-165 is well worth the money and a cheap Insurance Plan if you are replacing Injectors. Call us at (717) 861-7525 for additional discounts before ordering. 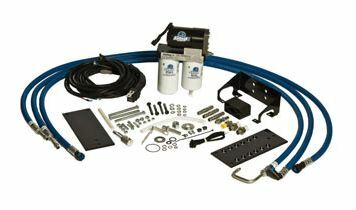 This entry was posted in Products and tagged AirDog II, DF-165, Fuel Preporator, Lift Pump, PureFlow AirDog by East Coast Diesel. Bookmark the permalink.